I’ve enjoyed sharing cultural holidays with my little girl over the past four years, but Día de los Muertos is one that I’ve held off delving into until now. I recently wrote about my daughter’s obsession with death following my grandmother’s funeral last year. But I felt that after talking so extensively about the subject of loss for more than a year now, I was ready to talk to her about the life of my father, whom she never got to meet, and her great-grandparents. 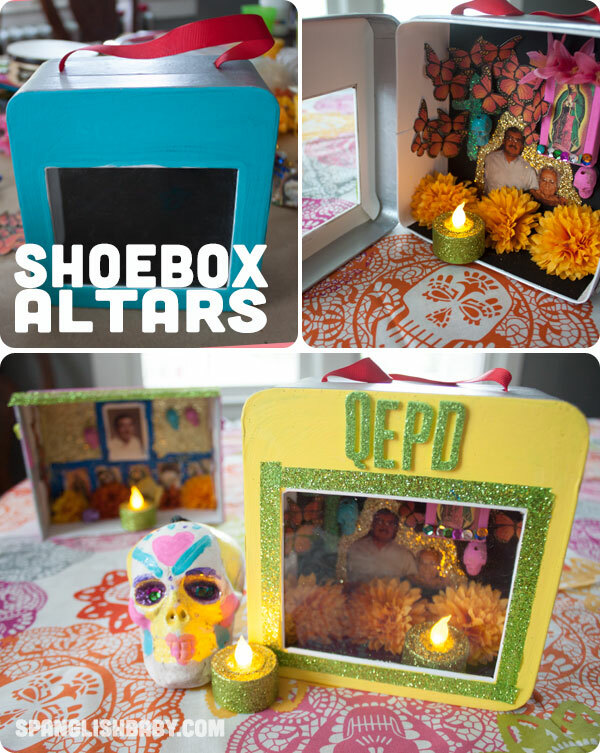 So, I decided that for Day of the Dead, we’d make mini-altars out of shoeboxes and mini-matchbox shrines, and in the process of creating, I could share stories about our antepasados. I started with a stack of old photos to spark the conversation. I chose photos with our loved ones at various ages to show her the progression of life. I let her pick the one she wanted to use in her altar. She chose a photo of my dad from his years as a high school math teacher. I took a photo of my grandparents together, to use for a mini-matchbox altar, and another of my father and his mother to use for my shoebox altar. There are many ways to build an altar. In the end, it’s really about honoring your loved ones, not mourning them, so using things like bright colors, glitter and beautiful flowers is key. I took several empty kids shoeboxes and painted them over with brightly colored water-based acrylic paints. I actually lucked out because I had several shoeboxes of See Kai Run brand baby shoes, which come in a cute silver shoebox with a clear opening to see inside – perfect for shoebox altar-making! I then lined the inside of the shoeboxes with black cardstock. 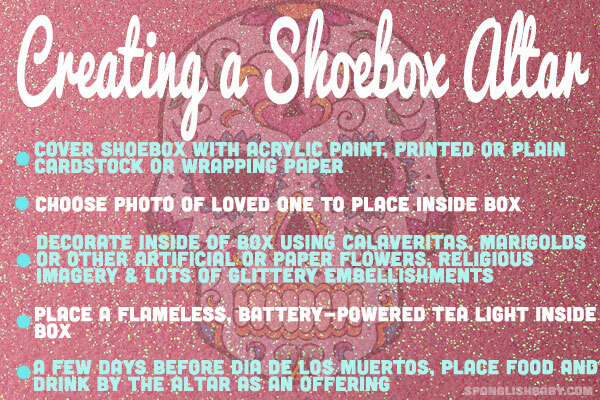 I wanted to stick with some of the essential elements of Day of the Dead, so to decorate the inside of the shoeboxes, we used calaveritas (which I painted over in pink and turquoise), marigolds (artificial), religious imagery, paper-punched Monarch butterflies (we used a Martha Stewart butterfly border) and lots of glitter and glittery embellishments. I used a simple glue stick or regular glue to affix mostly everything, but I did have to whip out the glue gun for the artificial flowers. Finally, I added a flameless, battery-powered tea light, which flickers like a real candle. 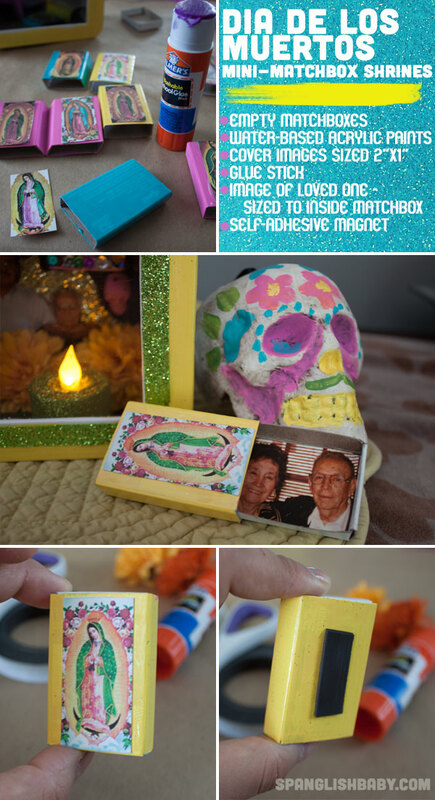 The mini-matchbox shrines were even easier to make – just paint over or cover with paper the outside of the matchbox, affix with a glue stick an image of your favorite santo and place an image of your loved one inside. You could also add glitter and embellishments around the outside image. I added a self-adhesive magnet on the back so that we can keep the matchbox shrine on our refrigerator after the holiday is over. We’ve put our little altars and shrines next to our Halloween pumpkins in our dining room. Yes, we are having a truly bicultural celebration this year! A few days before Day of the Dead, we’ll put out some food and drink by the altars to beckon the spirits. I know they’ll be happy with our offerings, which were made with much love and care. Have you ever created an altar for a loved one? What do you use to create the altar or shrine? The mini matchbox shrines are so cute!!! Thank you so much! I am in middle school, and for Spanish class I had to make a Day-of-the-Dead altar! This made it so much more easy, not to mention fun! You are amazing and I can’t tell you how thankful I am! Thanks. I have limited space for my shrines, and these are perfect.